Skittlish is a nice and clean minimalist wordpress template. It has two columns – the main content area (which is white) and the sidebar on the right side which starts out orange, but there is a menu in the upper left corner where surfers can select and change the sidebar color. There are 7 colors to chose from. Netxt to the colors menu the surfer also has an otion to stretch the theme (and see more text) or subtract it. 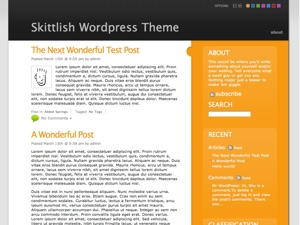 Skittlish wordpress theme was designed by Cristi Balan.